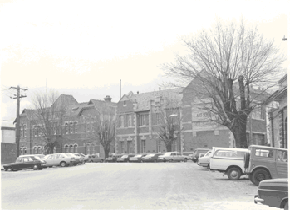 The Ballarat Technical Art School Building was erected on the site of the Former Ballarat Courthouse, the first building used by SMB in 1870. Sir Alexander Peacock opened the Ballarat Technical Art School in July 1915. It cost 10,000 pounds and was constructed by the Public Works Department from plans drawn by the then Art School Principal, Herbert H. Smith. The building contractors were Messrs Gower and Eddards. According to the SMB Annual Report of 1914, 'the internal upholstering and fittings have all been carried out in Australian timbers, with Queensland maple largely used throughout.' Before this building was constructed art and craft classes were held in various buildings around Ballarat. The building could be described as federation-art deco in style. It features sandstone insertion with sandstone string coursing. The base of the building is rusticated sandstone. The relief stone panel on the front with the words "Technical Art School" features stone pilaster brackets and corbels. In the centre front, rectangular sandstone pediment with decorative stonework incorporating the date of construction can be seen. The windows in the lower floor feature five supporting keystones whereas the upper windows have sandstone lintels. The building also features decorative cast iron downpipes. The entrance on the northern side has attractive lead light glazing in an art deco style. Above the door, a miner's lamp and pick are featured in the design. The building is functional in design with large metal windows in the south wall to ensure good light into the studios. The northern wall has standard double hung windows. The interior of the building features a carved wooden staircase and cast iron ceiling vents. The rear drawing studios can be made into one large studio by opening panelled timber doors. This opening features classical plaster pilasters with a pediment above.